Add some of the sugar to a pot set over medium-low heat and caramalize. Zest and juice lemon and deseed vanilla bean. 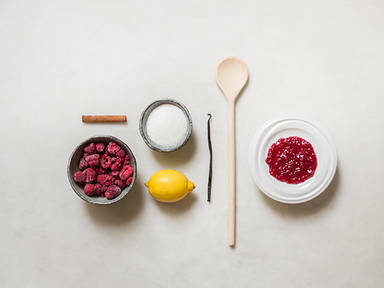 Add raspberries to pot along with cinnamon stick, scraped vanilla bean and seeds, and lemon zest. Deglaze with lemon juice. Add remaining sugar, stir, and let reduce for approx. 5 min.. Transfer to sterilized canning jars and enjoy!